Aaron Ohm was the son of industrialist Eric Ohm and when this rebellious teen finds out about Ohm's Industries new prototype combat suit he just had to steal it. 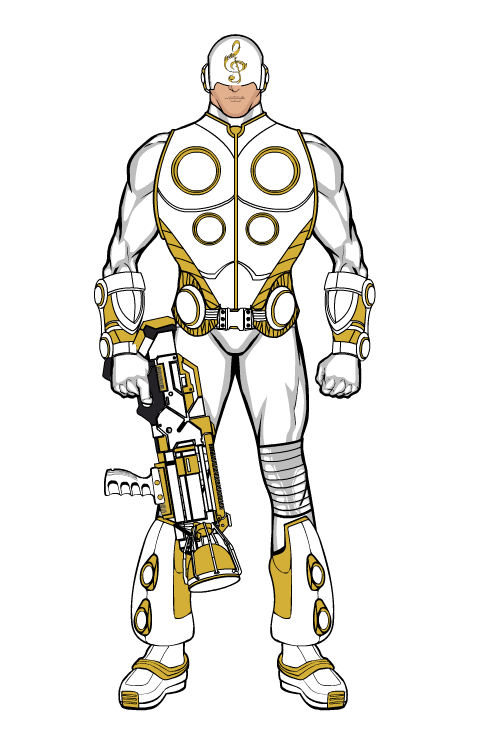 Thunderpunch wore a suit that absorbed latent static electricity and used it to power its destructive capabilities particularly a large gauntlet on the right hand. Thunderpunch was your run of the mill small time villain until he faked his own kidnapping in order to extort millions in ransom from his wealthy father. When the resident superhero team, the Freedom Fighters, arrived on the scene, they quickly "rescued" him and defeated a henchman wearing the Thunderpunch suit. Afterwards, he was offered to join the team as a sidekick. Aaron proposed rebuilding the broken Thunderpunch suit since he had no suit of his own. The Freedom Fighters thought it was an excellent idea, and so the "hero" Ion was born. For months he maintained a double identity as his new hero persona Ion and the villain Thunderpunch in a rebuilt suit that "mysteriously" incorporated some of the Freedom Fighters own technology. During that time he discovered all of the identities and weaknesses of the Freedom Fighters in addition to enacting several schemes, which included briefly taking over Freedom City (Not related to the official setting) and framing his father as the villain Thunderpunch. In the end, when it came time for Thunderpunch to use all of his knowledge to kill the Freedom Fighters, they were able to overcome Ion's betrayal and survive the encounter. Unfortunately, Thunderpunch was killed by a telekinetically controlled stalagmite to the face, ending his scheming forever. Though Revenant was only appeared in two sessions, he may be the most horrible and feared of all of my group's villains. One of the members of the Freedom Fighters was a blind psychic named Psyking. Psyking never had very strong control of his powers (see: Uncontrollable flaw) but trained to use them for good after his mother was killed by street thugs. Well on one adventure involving demons, time travel, and dimension hopping the Freedom Fighters were banished to an alternate reality. In this reality, Freedom City was on the brink of destruction and ruled over by three factions of supers. The Freedom Fighters had never existed and instead due to the usual one small alteration, everything had been propelled down this darkest timeline. The most incredible and evil of all these changes, was the villain Revenant, an alternate version of the hero Psyking. Completely crazy and having embraced his lack of control of his powers, Revenant was a powerful psychic who wore an even more emo version of Kylo Ren's getup. He would make himself invisible to the minds of his enemies, read their minds, and bring up their most painful and horrific memories, playing on their insecurities. During his brief appearance, Revenant killed the alternate timeline fiance of one of the Freedom Fighters, doomed the city to destruction by an atmospheric heatwave, kidnapped not one but two members of the Freedom Fighters, and impersonated his alternate self. In the end, Revenant's schemes were uncovered and he was thrown into a pit before having several cars thrown on top of him. However, even after escaping the alternate reality, the Freedom Fighters still worry he might have somehow survived or worse yet that Psyking might one day snap and turn into the monster they all feared. My group's latest campaign is a sequel to the original Freedom Fighters campaign featuring a new generation of heroes training to get ready for the big leagues (think Young Justice or Teen Titans). The Freedom Fighters is now a training team for young heroes that has split into two different teams, Team Freedom and Team Fighters. Our campaign follows Team Fighters, and by far and away their greatest villain has been Brainstorm. Brainstorm is your classic evil alien scientist who has come to Earth to experiment on the local fauna. A tall and thin, blue-skinned and wrinkled, Brainstorm got his name from the top of his head. There a glass case covered his head from which his brain was visible. The electric synapses from his brain fire off erratically at times and bounce off the edge of the glass case. Utterly brilliant and unquestionably mad, Brainstorm has been caught twice now in the middle of experimenting on humans. He has personally tortured the same member of Team Fighters twice, had one of his minions fire an SMG point blank into one the Fighters he had strapped to his operating table, and took and NPC member of the team and removed several limbs to build a monsterous cyborg version of her. Everytime he has easily escaped the clumsy attempts by Team Fighters to bring him in. He is known to have connections of crime synidcate that is smuggling alien goods onto Earth and is currently working to sabotage to the first ever Superhero Olympics. All around a particuraly nasty fellow with a hilarious nasally, rasping voice that my group loves to do impressions of. Man, the hardest thing about GMing for me is creating villains. You make it look easy. "Is you lookin' at me kid? I think you is lookin' at me. You prolly are sittin' back right now thinkin' to yourself, "Who is this Gorilla and why does he have a tommy gun?" Well, the answer to that kid is simple. I'm the Gorilla Godfather, and you, you are about to be one of my clients. Yeah, see, you gots a nice place here. A real nice place. Be a shame if somethin' were to happen to it. I mean, you sell what, antiques, like China and plates and vases and such? What would happen if, I dunno, like a buncha' monkeys from the zoo or somethin' got loose and came into your store? You ever had to like, you know, clean up after a buncha zoo monkeys? It ain't pretty I promise ya. However, for a small fee, I can ensure that such an event does not take place." The Gorilla Godfather is a Gorilla... Who is a gangster. He has a mountain of monkey minions to do his dirty work too. At one point Peanut the Gorilla was just a Gorilla in a lab. Until strange experiments on him increased his IQ and gave him psychic powers. His psychic powers allow him to control all forms of primates, but not humans, not yet. In addition they grant him a danger sense as well. When Peanut was a monkey, the scientist who ran the lab used to leave the TV on and loved gangster films. The Godfather, Scarface, and the like. Naturally this exposure warped the Gorilla and eventually turned him down a path of crime. Now the Gorilla Godfather is takin' over this town, and with the help of his Monkey Mafia it will take a special kind of hero to take him down. The first of the two that seemed to have most unnerved my players is Branson. It was early in the story arc, and the heroes had gotten wind of an all-out gang war brewing among the different factions of the city's underground. Branson was a professional assassin who was hired by one gang to take out two leaders of another gang (brothers) who were sort of wild cards, in that no one else knew what their powers (if any) were. So the heroes stake out the targets, and at some point start notice his crewmen dropping like flies, one-by-one. The targets are panicking and at a loss as to what to do. The heroes swoop in, and the team psychic can tell that SOMEONE is doing something, but not how... even reporting how at one point the assassin walked up to one of the heroes, smirked in his face, then continued taking out the henchmen protecting his targets. But no one saw him do this. Even "standard" responses like throwing paint across the room to mark him wasn't working. He wasn't invisible... he was unnoticeable, which was an order of magnitude trickier to deal with. The party wigged out and started panicking. Eventually they beat Branson (the guy had no other powers and was just using a sword,) and saved the gang leaders (which they were VERY glad of several sessions and another story arc later,) but to this day the idea of having to face him again seems to disturb them greatly. A recurring villain/villains in a game I ran was the Remaining Man; different versions of the same man from potential futures where the heroes screwed up so badly, he's the only one who survived. His powers, beyond enough durability that it was plausible for him to have survived a variety of apocalyptic scenarios, changed each time; the heroes had to not only figure out how to beat him each time, they had to figure out how to avert the scenario that led to his coming back in the first place. Really tied into a greater theme of choice and consequences that had been running through the whole affair. Dr. Edwin Lazar was a brilliant medical researcher working on a cellar regeneration project that would allow people to heal at an accelerated rate. Unfortunately when testing his creation on tissue samples beset by a flesh eating bacteria it mutated the DNA of the bacteria itself, and it began to replicate with alarming speed. Lazar was soon infected by a bacteria that could strip flesh as rapidly as a school of piranha and to save his life he had no choice but to use his regeneration treatment on himself. His body is now a ceaseless battleground between the mutant bacteria and his own regenerative ability. The microbes, feeding on his constantly regenerating flesh, never run out of material with which to replicate themselves. His appearance, constantly changes, as skin is constantly stripped away and grown back before his very eyes; a human patchwork of never ending decay and renewal. He lives now in a bio-containment suit designed to isolate himself, and more importantly the bacteria, from the outside world. Dr. Edwin Lazar has become an immortal walking pestilence. Last edited by Bad People; 07-26-2018 at 08:45 AM. A group of terrorist parahumans whom have recently banded together for reasons unknown. The group contains members of worldwide infamy, their origins spanning the globe, however after banding together they are almost exclusively active in the united states, performing acts of random mayhem combined with politically targeted crimes such as assassination and kidnapping. The exact number of members involved is a mystery, as to their goals and creed, what is known is that the group is working towards something and it is big, something or someone with enough weight to hold together a group of psychopaths ranging from assassins to simple crazed mass-murderers and force them to cooperate. Dr. Litchenstein - AKA Docter Richard Richter. Formally a world renowned surgeon and doctor, the man was a legend who often went into the harshest battle fields in the most dangerous of countries to save as many lives as he could. The man's skill was incredibly, said to bring even the dead back to life, his miraculous surgeries succeeding where it should have been impossible. For reasons unknown he simply stopped, while he still went out to these war torn countries rather than save others he simply added to the suffering. He would kidnap the injured, holding them hostage as he slowly took them apart and performed experimental surgeries on them, ranging from replacing organs to stitching together amalgamations of people and creatures who begged for death that was all but impossible to give. As it turned out the man had been given an incredible ability, one that should have belonged to saint but was now used for evil. While touching him nothing could die, not a person nor even the cells in their body, and he used this to torture others by keeping his vicitms alive in the most horrific of states, implanting parts of himself in them to sustain them even after he'd left. As time went on and efforts were made to stop this madman he started to escalate, no longer satisfied with just civilian victims he sought to elevate his craft by using the various parahumans sent to kill him. He'd transform them into monsters, self sustained by their powers, or try and combined interesting parahumans together in nightmarish ways just to see the result of the interacting effects. After a time, even that became boring and he turned his attentions on himself, implanting organs and limbs from his victims to control them as if they were his own and access the various powers. The only saving grace was the man's lack of ambition beyond his own horrid amusement as it prevented an even greater scale of disaster with the means he had available to him. He'd often find it a much greater priority to be humorous or spontaneous in his evil than efficient, doing such things as stealing useless or even self destructive powers for the sake of a joke and would willingly walk into obvious traps secure in his own immortality. The latest in a long line of assassins, all bearing and passing on the name Kortic for the protection of it's people. The first Kortic being a famous terrorist whom succeeded in killing the king of the time and was summarily executed by the nobility soon after once captured (though the legend states the man had allowed his own capture) which catylized a civil war in the nation, quickly leading to the overthrowing of the aristocracy. The second appeared soon after, a tool of the revolution to assist in the take down of the nobility and ushering in the new age of socialism. The Third however was nearly 50 years delayed, working for a counter revolution seeking to remove the socialized and tyranical leadership which failed in their lifetime, though succeeded in weakening the nation to the point it would become a vessel state for the larger Russian state. The Fourth is unknown, only attributed victims that would not fit for the third nor fourth given her apparent age. The Current Kortic is a young child, appearing little more than 10 at the oldest. She is a sadistic and cruel person, uncaring of collateral damage nor the type of target she's been given. She is more than willing, eager even, to kill anyone in her path to her intended victim and those around them. Bombings, poison gasses, hostages, and torture are known tools of hers, and ones she will use regardless of how public the audience nor number of victims. The full scope of her abilities and personality is unknown as few who've interacted with her have survived, but surveillance of her crimes captured during the act have shown possession, cloning, and touch based control of objects to be powers she possesses though employs randomly.